Ringing clarion calls for fairness can be a cinch: Find sympathetic people, unearth someone who delivered them a sucker punch, then scream “foul!” Voila. We’re righteously indignant. But what if the punch slammed someone with whom we adamantly disagree? What if a news organization cuffs a tea party leader? Is not unfairness still unfair? Why yes. It is. So I hereby cry foul at Newsweek’s recent cover of Michele Bachman, a presidential candidate for whom I will never vote unless she falls off a horse on her political Damascus Road. The magazine was patently unfair when it selected a photo that makes her look like a crazy woman. I can see the snickering boys and girls in the newsroom pinning it to a wall and guffawing their guffaws. All well and good for the office, but not for the cover. Who among us has not winced at our own errant portraits? Have we not all appeared worthy of a Post Office wall? Slap on the ankle bracelet and keep that lunatic under a 24-hour watch. We blush. We laugh. We show the pictures to our friends so they can have their hardy-har-hars, but we don’t frame them and prop them on our desks. We edit – as did the Newsweek editors with their not-so-hidden agenda. I’m not calling for Newsweek to be “unbiased” or “objective.” That’s the nearly unobtainable goal of daily newspapers. Magazines, at their best, have always given us educated advocacy. Newsweek initially presented the more liberal angle to answer Henry Luce’s conservative Time Magazine, which has since changed. But we can still be fair to those we criticize. Worthy coverage of Michele Bachman would probe her ideas and factual errors. As it stands, Newsweek was so obviously unfair that it’s won her sympathy from the right and left. Perhaps it garnered her votes. Once again, the real issues have been veiled in a cloud of cheap shots. Maybe it’s me…and I did see the comparison shots, above so I thank you…but I just don’t see it. I have looked and looked and looked. 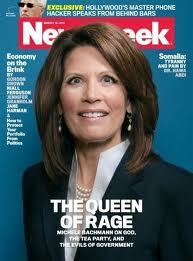 And what I see is not a crazy Michelle Bachman on the cover of Newsweek. Nor do I see an angry Michelle Bachman as the headline suggests. What I see is a person who is…smiling…perhaps even crinkling up her eyes in laughter. I have heard all the comments about the photo making her look crazy or crazed or whatever, but I just don’t see it. If anything, the shot made her appear more human to me. Human (or Christian) or not, I still won’t vote for her but I think this is particular brouhaha is a controversy about nothing. But, then again, maybe it’s just me. Shusssh, shusssh. You’ll give her a headache. Chuck, this is the first time I have disagreed with you. I guess we can not be friends anymore. Just kidding. Maybe there was an attempt to choose a picture that emphasize the wide-eyed look she sometimes has; but, it is not manipulated as we sometimes see with other high profile people. If this conversation was about being kinder to all people, and because of this she and many others would be kinder, I might be impresses. Instead her followers will feel that they were right all along; and her critics will feel that they were right all along. I read the article and it did not change my mind about her as a political candidate. Correction, your comments are about being kinder to everyone, but the larger conversation in the news and on the talk shows is not. Betty: I’m sure we’ll make up after my next entry. My quarrel is with the choice of the photograph, not with the article itself (I haven’t read it yet). I’ve called for FoxNews to be fair to Obama. Fairness must be spread around. I just don’t think that this was an unfair choice of photograph. It is obviously one made with her permission, maybe she even paid to have it taken. Betty: Rarely would any news organization seek permission for the publication of a photograph — and if Newsweek had sought permission, I would have been against it. To clarify: She probably sat before a Newsweek photographer (and they would not have paid her), I doubt they would have asked for her permission on which one they would published. That is simply not done. Charlie, I admire you for your good and decent heart. I think you can see the good in everything and everybody. I admire you for that. But the subject of this discussion is so totally mundane and unimportant that I will not address it further. If America falls for the clap trap being peddled from that side of the fence, then America deserves every bit of the pain that will ensue— every but of it! I think you could do more with your humble prayers than all those so called “Christian” nut cases who are using Jesus to stir up their religious base for the sake of votes–just like they do at every major election cycle. It is disgusting. Some of these religious people are clowns, plain and simple..calling the Statue of Liberty a demonic idol and seeing unborn babies floating in clouds and all the rest of that stuff that has been reported about this kind of people… can any half-way intelligent citizen actually see that kind of person leading this great nation in a time of crisis? I can’t. Pray for us, Mr. Redfern..I think God would hear your prayers because your heart seems to be pure. John: I’m “Chuck,” by the way. Yes indeed, there are nut cases out there. And perhaps this Newsweek picture of Bachman will not go down in history. But the larger issue of fairness is important and deserved the few paragraphs I gave to it — just like the previous entry vis-a-vis Fox News’ treatment of Obama. I would only vote for Bachman if she were running against Sarah Palin — and I would be preparing for national and international catastrophe while I pulled the lever. But, in this case, the issue is not whether we vote for her but if we will be fair to her. If I’m going to call for fairness for those with whom I agree, should I not do so for those with whom I don’t? I assumed that this was one of those photo’s that she had made and Newsweek chose it from among others. It is a well made photo and she is dressed well. I don’t like all the pictures made of me. They show that I am overweight. I did not like the one chosen for the pastoral directory, but it is me, so what can I do about it?